This is more than a week-end, it has been augmented to 4 days. And we want to devote it to Digital Ethnography: The field of digital ethnography has been growing in recent years, and the focus has changed, from looking at online phenomena as belonging to a world apart, to ‘cyberspace’ , to studying how online cultures, practices and life forms integrate and combine with off-line practice (to the extent that that distinction is still possible). 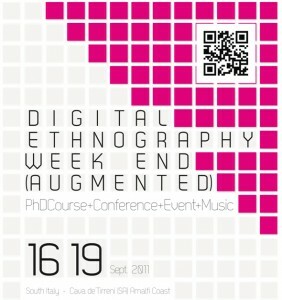 In this weekend we want to expand the concept of digital ethnography even further, both practically, theoretically and methodologically. We will build on the combined competences of Robert Kozinets who has been studying and practicing digital ethnography for almost a 15 years. The Centro Studi di Etnografia Digitale, which has done the same for about a year, and the RBB project at the Copenhagen Business School where an number of innovative quantitative approaches to online life have matured. The program will be organized around three day workshop on ‘netnography’, run by Robert Kozinets. The workshop is open to Ph.D students (credits can be arranged) and others who want an intense, immersive experience of hands on digital ethnography, as well as for auditors who just wish to listen and learn. Robert Kozinet’s workshop on Digital Entography will involve 10 people seated around a seminar table who participate actively, discuss readings and perform research tasks. Active participation is primarily suited for PhD students who will receive academic credits for their work. The seminar table will however be placed on a scene sourounded by a listening public that will be able to listen to the conversartions and follow the course action as it unfolds. Along with the workshop people from the RBB project at the Copenhagen Business School and from the Centro Studi di Etnografia Digitale, along with a few guests (yet to be confirmed) will present their perspectives on Digital Ethnography and how to theorize online culture in general. The event will end with a one day public conference on the 19th, where we will try to reflect critically on recent theories of the web and its social importance: are social media really that important, after all? Deadline for enrollment 7/8- 2011. This week-end is co-organized by Societing and the Centro Studi di Etnografia Digitale. Societing is a collective of researchers and professionals that are interested in new forms of economic and political innovation. Our blog societing.org (in Italian) gathers contributions from thinkers and practitioners who are interested in fields like social innovation, social entrepreneurship, social movements, new media, alternative currencies, social finance and so on. The societing collective also organizes a Summer school in the last week of August, on new media and social change in the Mediterranean (http://www.societing.org/summerschool/ ). The Centro Studi di Etnografia Digitale is a group of young researchers that are engaged in developing theoretical and methodological approaches to qualitative online research. The group has accumulated a range of publications in Italian (visible at www.etnografiadigitale.it) and has worked for corporate clients like Google, Nestlé, Chicco, and Barilla. Our academic sponsors are the Graduate School of Social and Political Sciences at the University of Milano, and the RBB project at the Copenhagen Business School.